Shortcut Way to Become "Crorepati"
First of all, understand that this plan is not about saving, its about INVESTING, and there is deep difference between saving and investing. So, first of all you need to invest in long term growth assets to get your money high return and to compound your money. 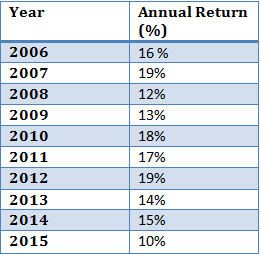 If you look at the below image where you can see last 10 years of sensex data, where minimum return provided by equity market in india is 12% and in some years it is even given abov 15%. While some fixed income source only gives you 7-8% (Fixed deposit). So, you need to invest Rs.5000 in equity shares. No, investing in equity share market is NOT the only option but it is the easiest way to convert your monthly 5000 to 1 crore. In case you invest in fixed deposits, you will get 1 crore but it will take almost double of time than this plan. So that’s all depends on the return of investment. If you invest in lower interest rate (and safe fixed deposit) you need to invest (or SAVE) more amount to get 1 crore (in 20 years). For example, if you invest in fixed deposit which gives 7% than you have to invest Rs.19,196 per month And so on. If you invest in equity scheme which gives you 15% than you need to invest Rs.6679 for 20 years. What if you don’t know which share to invest? Yes, share market is not for newbie. So, to get perfect portfolio you can take help of advisory firms which will advise you on which share to buy (or you can check our list of best share for 2016). Also, if not share market, you can go with mutual funds too. That’s biggest benefit of mutual funds, as your fund manager will take care of our funds (As they are highly professional, experienced). Just get the best mutual fund scheme to invest and enjoy high return. You can go with equity mutual funds as it directly invests in equity share market. Yes, you need to invest for long term as in long term; your investment gets compound interest benefit. 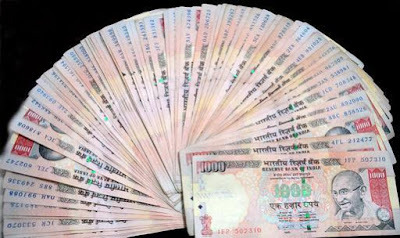 Also you get benefit of accumulate amounts. For example, if you invest Rs.5000 for 10 years you will get accumulate income of Rs.13.76 lakh for 15% of annual return as the yearly return also added up in your investment. This is power of compound interest. The only thing is BUY & HOLD. You need to HOLD your investment for long term. By this way you can make your monthly 5000 of investment in 1crore in 20-22 years. No need to take part in "kaun banega crorepati" ;).